• to stop the Concealed Carry Reciprocity Act (a bill that makes mass shootings easier). The Senate is considering a bill that is a top priority of the NRA. This bill would require states to recognize the gun laws of other states, essentially forcing them to accept lower standards than their own. That means that gun owners from states with minimal restrictions like Florida’s could legally carry their weapons anywhere, even to a state that would normally have prohibited them from carrying a gun. This bill has already passed the House, and the Senate is expected to bring it up this year. Read this resource on the Concealed Carry Reciprocity Act. • to protect the civil rights of all Americans - LGBTQ . . . The Trump Administration’s Department of Health and Human Services (HHS) continues to weaken or terminate policies that specifically protect LGBTQ employees and patients. Health care workers who do not wish to treat LGBTQ patients are protected under a new “religious liberty division.” Existing transgender staff protections have either been rolled back or simply ignored.
. . . and ADA. Joan Herman's illuminating article in Friday’s Daily Astorian was about a bill that passed the House which would potentially gut the Americans with Disabilities Act (ADA). HR 620 is now headed for the Senate. Suggested scripts for talking about this and other issues are here. • to protect American elections. While there is no evidence of votes being changed, U.S. security officials have determined that Russian hackers made inroads in 21 states. Trump hasn't authorized definitive action to protect the US from further Russian interference. Speaker Paul Ryan removed from his post Matthew Masterson, who has been leading efforts to help states shield their voting systems from cyberattacks, including those originating in Russia. 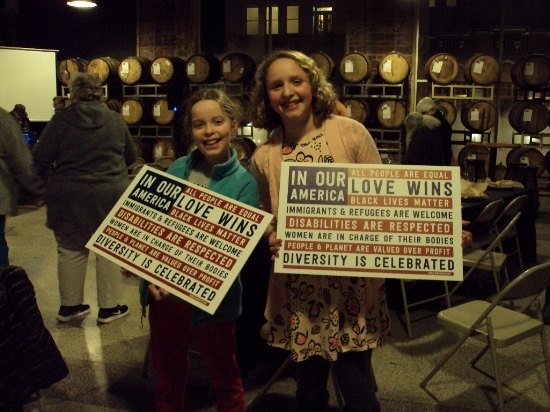 These girls love their new signs, which they got from INCO at Ales & Ideas on March 1. • The Parkland students started Parents Promise to Kids: "“We want parents to sign a contract promising their kids that they’ll vote for leaders who put kids’ safety over guns.” Read more here. • Senior Emma Gonzalez, who now has more than 1.1 million followers on Twitter, has seen her audience expand by tens of thousands of new followers each day since Feb. 19 according to data from SocialBlade. Gonzalez now has more Twitter followers than the National Rifle Association, which has more than 600,000 followers, as well as NRA spokesperson Dana Loesch, who has almost 800,000 followers. 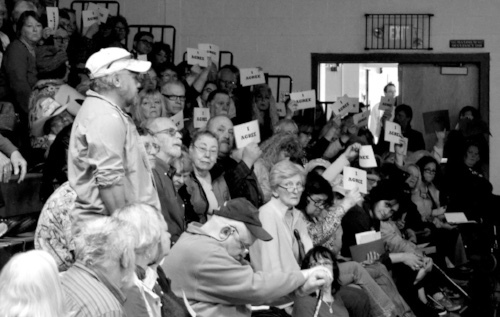 Indivisibles spoke up at at Rep. Bonamici's Town Hall at Warrenton High School last April.